Event planning isn't one size fits all. There are multiple job titles that fall under the umbrella of event planning. Convention planner, event manager, meeting planner and many other titles exist for event planning. And as this diverse industry grows so do the job descriptions. As of 2016, there are over 500 million jobs in the UK that fall under the event planning industry. At Conferences UK, we specialise in multiple areas of event management, but our number one focus is helping you find the best conference venues for your event. We offer a complete list of conference venues in London and beyond to satisfy any size event. But if you aren't quite sure whether you need event management assistance or event planning assistance, we're going to break down the difference and what you can expect from each respective service. Even though these terms are used interchangeably, they really are two distinct services. After all, every successful event relies on comprehensive planning. We'll start from the beginning by answering what event planning is and how most people use it. Event planning encompasses pretty much every event you can think of. From weddings to baby showers and birthday parties, it includes all the basics. It also covers corporate gatherings that would require you to rent out something like the Nottingham conference centre. Event planning starts the moment you decide you are going to have an event. This process continues pretty much through to the day of your big event. For event planners it typically continues to the other side of your big day with follow up emails, making sure all vendors received their payments, and ensuring that any post-promotion is up to speed. The first step is in this process is to discuss your event ideas, themes, and deadlines to get everything done by. Nailing all this down is crucial to have a successful event. You need to be detailed when dealing with an event planner because they will likely be in charge of every facet of your event. If you leave out something important you could find yourself with an event that doesn't meet your standards. - Pick out the theme, color schemes, or any other decoration related decision. Event management is like putting together pieces of a puzzle. For most people, this is a migraine-inducing process-but for the pros, it's no sweat. They pull together every piece of your event, from the theme to transportation, to hotel bookings and more-they handle it so you don't have to. Their job is to ensure everything goes smoothly from start to finish. 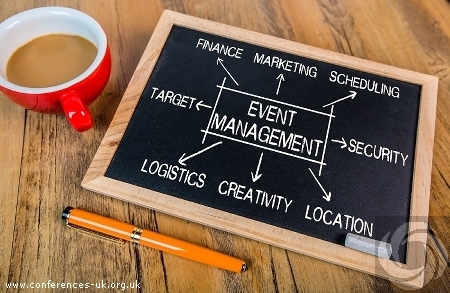 For the most part, event managers are the backbone of the event planning experience. They oversee everything so you don't have to. Their job is to see your event through to the end. If you're holding a larger event then you might want to hire both an event manager and an event planner, especially if you have wiggle room in your budget. If you're having a smaller event, then you might want to invest just in an event planner. Use your budget as a guideline. How many moving parts will I have? The larger the event the more questions you'll have to answer and decisions you'll have to make. Hiring both could save you a lot of time and heartache throughout the planning process. If you decide to hire both but still want expert advice on which conference venues are the best for your event, we'd be happy to help you. Contact our team for more information about our venues like our conference venues in London. We'd love to chat.